A unique and special blend of purple and white. 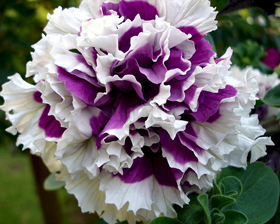 The most impressive fully double petunia 'Purple Pirouette' has huge 12 cm diameter bicolored blooms swirled in purplish shades and contrasting, white ruffled edges, each flower having a slightly different color scheme. A beautiful summer bedding plant, especially used in borders or on its own in containers. These compact mounding plants are quite early flowering with excellent weather tolerance. Plants grow to about 25-40 cm high. This impressive, fragrant and doubled flowered petunia will flower all summer to frost. Sow late winter to mid spring at 21-27C on the surface of a good seed compost and gently firm down compost. Keep soil damp but not wet. Do not exclude light, sealing in a polythene bag after sowing is helpful. Germination usually takes 10-21 days.